From my trip to the States of the last month, eventually I could take a glimpse of muffin's caps, actually a lot of supermarkets are carrying them them now. Just in case you didn't know... for a whole muffin its widest part in the middle is what people like the most, so food manufacturers only make the top but not including the bottom "cup" in order to suit these people's liking. The muffin cap resembles a mushroom's cap or a flying saucer. In a lighter note, it is always referred to a person's flappy and expanding waistline, I'm sure most of us have heard of this joke. I am wondering, when food manufacturers starts launching... rimless pizza? or bun-less hotdog? or skin only BBQ chicken wings? I have seen a gorgeous European-style pie-alike torte in a food magazine: a butter-enriched crust enveloping a dense almond (almost) flour-less cake. In fact, just the inside can stand alone and be a star herself, that's why almond cake is always one of the most popluar desserts at restaurants. Almond, egg, and butter are in very high quality in Europe, without much technique except a few stirrings, I could also create a restaurant-standard's dessert at home. I have baked this torte twice. After the big success of my first torte, in my second try I experimented adding coconut and increasing the amount of flour, but the cake didn't turn out as golden and moist as the first one. Please note that these photos showing here are from my second cake. I also experimented one more element... lining the baking pan with vietnamese rice paper (intend to crisp up the sides, and to unmold the cake even earier). The result turned out great. But you always can skip it by simply pre-grease your pan. 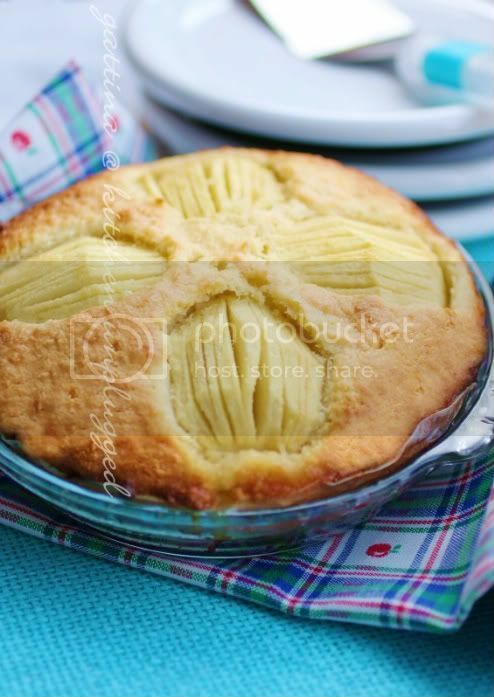 the recipe is abstracted (and modified) from "Tarta de manzana y almendras" published in Comer Bien numero 171. The cake is rich just like any other european torte, so a small piece goes a long way. Grease the baking pan with butter, and coat with ground almond. I used rice paper as well, first I soak it in water and remove it before it starts getting too soft, then line the pre-grease pan. In a big mixing bowl, beat butter, salt and sugar until it looks fluffy and creamy. Add eggs and beat until they well combine, finally mixing in almond and flour. The consistency is paste-y. Spoon the mixture into the pan, slightly wet your finger or spoon with little water to avoid stickiness if necessary. Peel the apple, remove the core and quarter into 4 sections. Slice the top but the cut isn't all the way down. Arrange the apple section on the batter and gentle press them down. Sprinkle some sugar and dot with butter on the apples. Bake the torte for about 40 minutes, test the doness by inserting a toothpick into the center, if it comes out almost clean, the torte is done. I don't quite understand the use of the vietnamese rice paper?Is it used as a baking paper to line the base of pan???? Have a great weekend, we are expecting Winter storm here. Gattina, I'm sorry but I still don't quite get it. 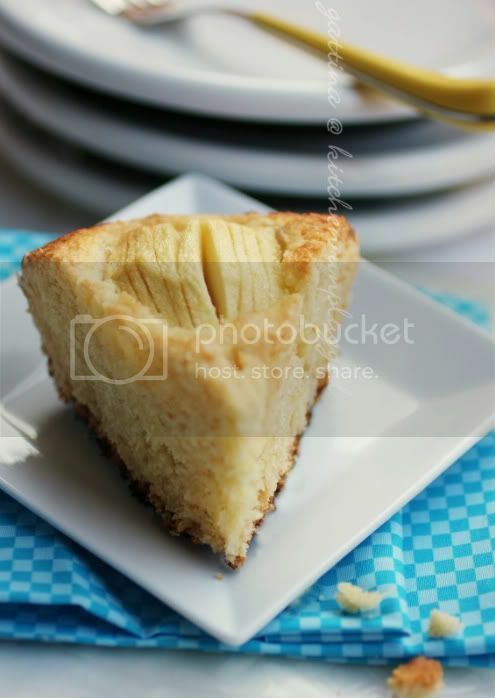 How can lining the base crisp up the sides? Pardon my ignorance! Did it work well and will this work with any other cake? I would love to try this concept too! My oh my....you cannot get any more creative than this! Always a work of art Gattina. Love almond cakes. Will check my oriental market for that rice paper. Very much like the effect! Hi Quinn, when I lined the pan, the rice paper also went up to the sides. During baking (hot), the batter of the sides started pulling (at least this cake behaved this way) so the hot air could sip in and so the sides turned out slightly crispy. But the rice paper that's on the bottom wouldn't be crispy. I don't know how the rice paper turns out when you apply to other cakes. If you did try... good luck and have FUN ... and please let tell me your result, thanks! What a fabulously looking almond torte!! I so love your recipe! Thanks for sharing, dear friend! Ah beautiful. I love the addition of alomnd meal to cakes. I've been doing that a lot recently, with fruit added, and love the outcome.